When I was growing up, I would wake up on my birthday to find the house decorated with beautiful tissue paper streamers. Year after year each of us kids would wake up to find these colorful decorations celebrating our special day. It was such a special tradition. I remember hanging these tissue paper streamers (we called them “slingers,” which is the Dutch word for streamers) at night for my brothers’ birthday celebrations. They were so delicately put together. I always wanted to replicate them. And now, a few decades later, I finally have made my own DIY Tissue Paper Streamers! 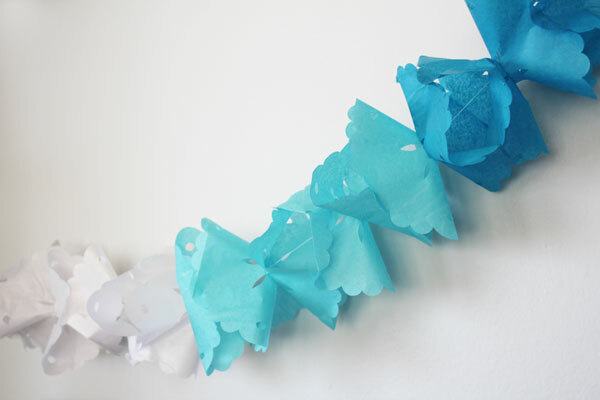 These DIY Tissue paper streamers were cut out using the Cricut Maker. 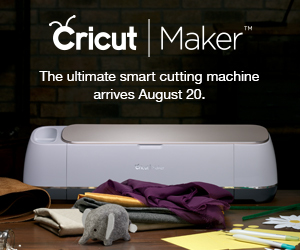 The rotary blade makes it possible to cut delicate materials, like the tissue paper. 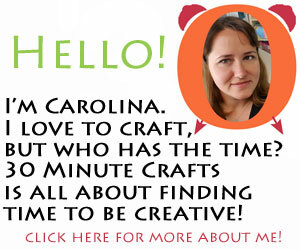 If you want to see more fun projects made by cutting tissue paper on the Cricut, scroll down to see more ideas! 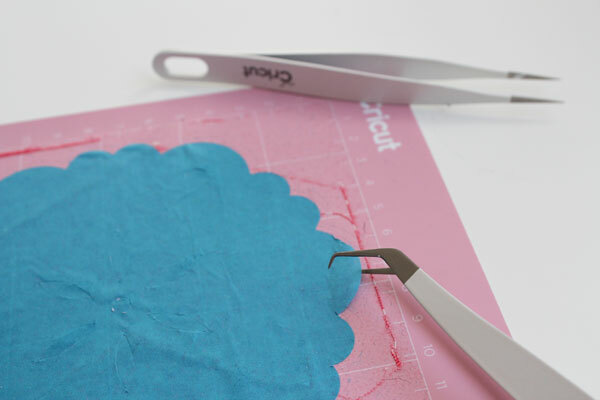 You can start by cutting the two small ends from cardstock. You need a pair of these for each streamer. They are important. Cut these using your regular blade (also called the “fine point” blade). 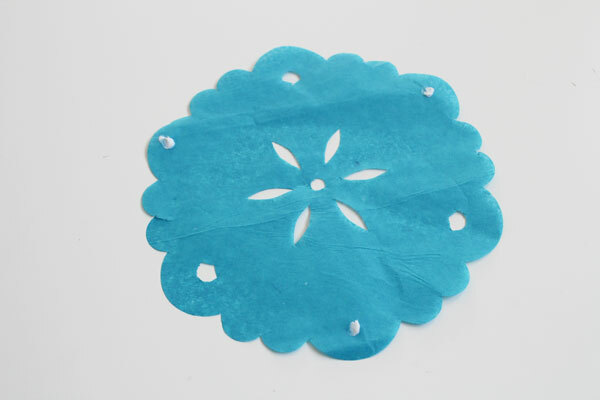 Then cut out the flower shapes on the very worn-out Cricut Fabric Mat using the rotary blade. If you don’t have a pink mat, you can use a blue one, but whichever mat you use you want it to be very, very well seasoned. Unusable for any other material. The mat you probably should have thrown out 6 months ago. So well seasoned that if it was on a dinner menu, it would have three chili peppers next to it. A mat so ugly only its mother could love it… and tissue paper. Tissue paper will love this thing. I cannot stress it enough – having a worn out mat is essential if you want to remove your designs intact, rather than scrape off remnants in frustration. 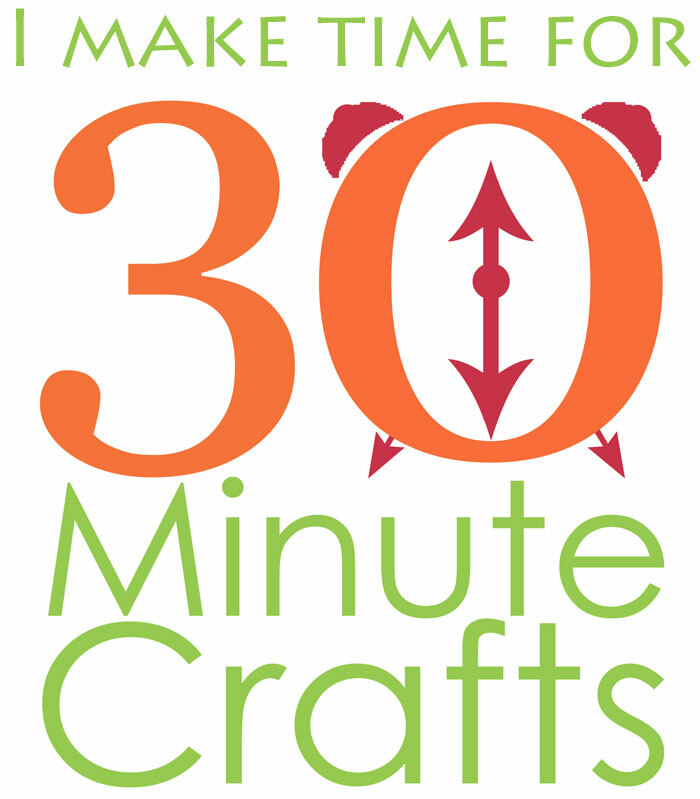 If you don’t have a well seasoned mat, this craft will take you much longer than 30 minutes to make. You can cut 8 of these flowers at a time on a 12″x24″ mat. I made mine in sets of 3 different colors. How many you make total will depend on how long you want your streamer to be, and how much time you want to commit to making the streamer. 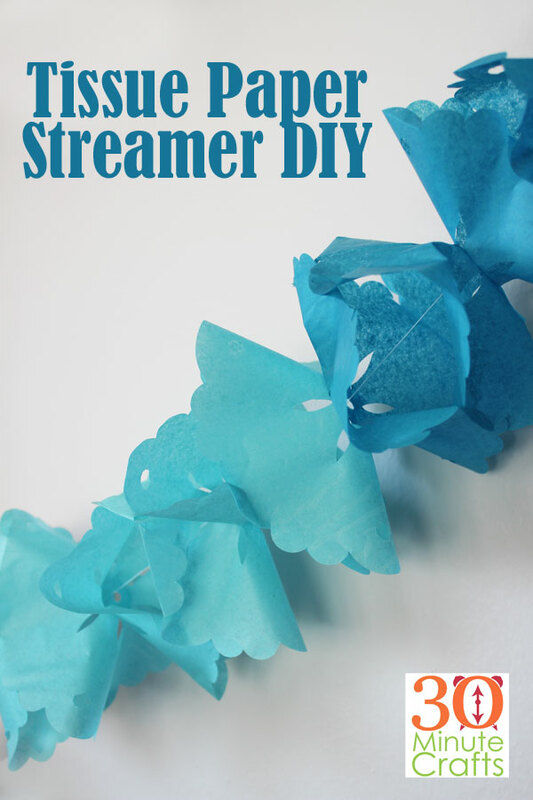 Every 8 pieces will make about 12″ of tissue paper streamer. 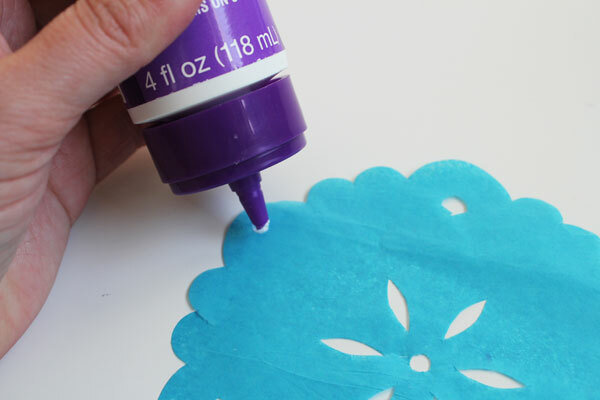 To peel up the flower shapes, start by peeling away the outside. Go carefully, but if it rips, it is fine. It is remnants anyway. Use it as packing material for a box, or recycle it. I tried different tools to pull up the tissue. My favorite was these curved tweezers. They slide best around the corners and under the notches to lift up the tissue. 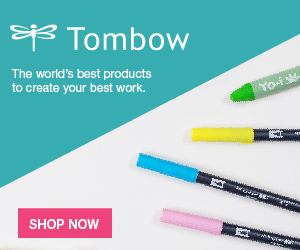 If you don’t have these tweezers already, they are part of the Cricut Essential Tool Set. Once you have some of the edges up, you can carefully peel up the whole design. Collect sets of two in matching colors. You’ll notice that of the 6 large curves, three have decorative windows cut out of them, and three do not. On one piece of each pair, add a dab of glue on the large curves that don’t have the notches. That is three dabs of glue. If you’re using watery glue, that will become evident at this point. 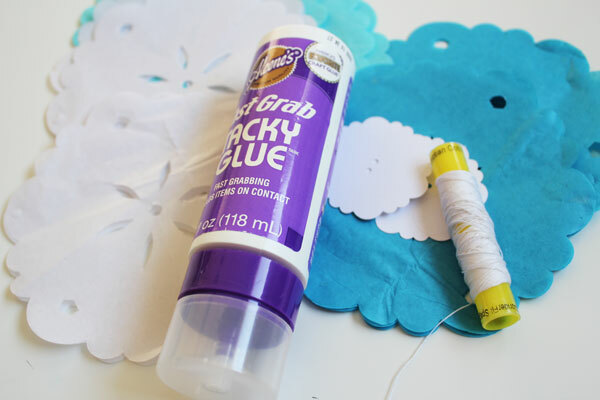 Find a more robust adhesive, because the glue running through the tissue will become really frustrating as you continue this project. Place the other half of the pair on top of the piece with the glue dots, lining up the curves and windows. Repeat with all the sets. 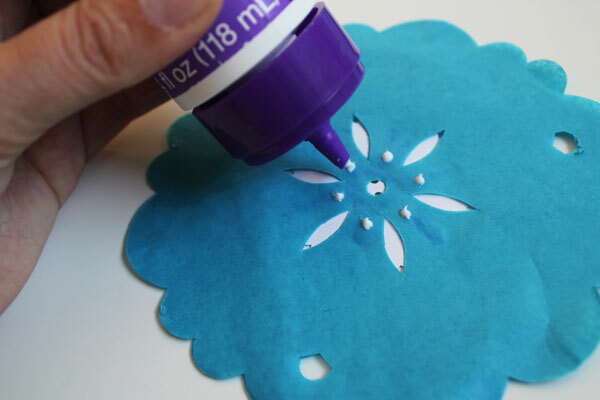 On each end, glue one of the small cardstock flowers. Start stacking the pairs. Between each pair, add dots of glue around the center. 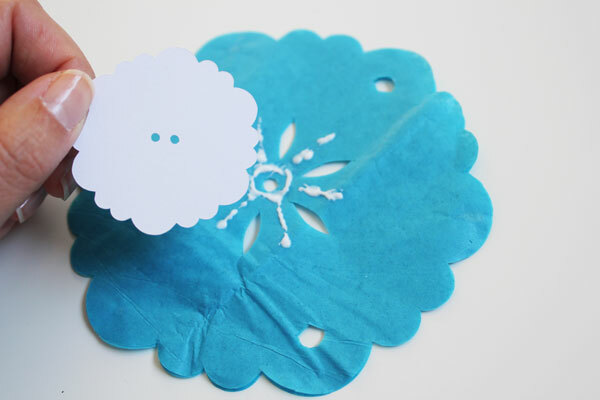 Start with one end piece with the small cardstock flower attached, cardstock side down. Finish with the other endpiece, cardstock side up. 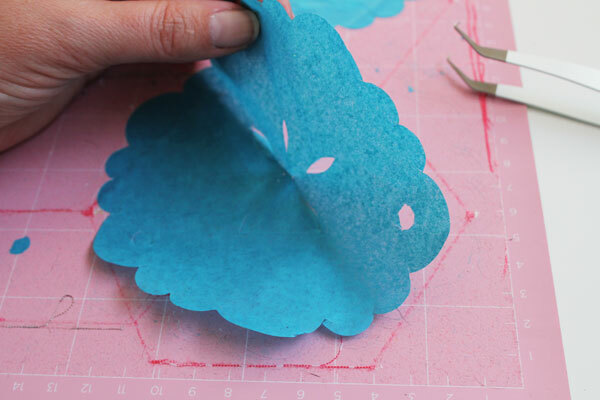 When you’re finished, you’ll have a stack of tissue flowers sandwiched between the two smaller cardstock flowers. 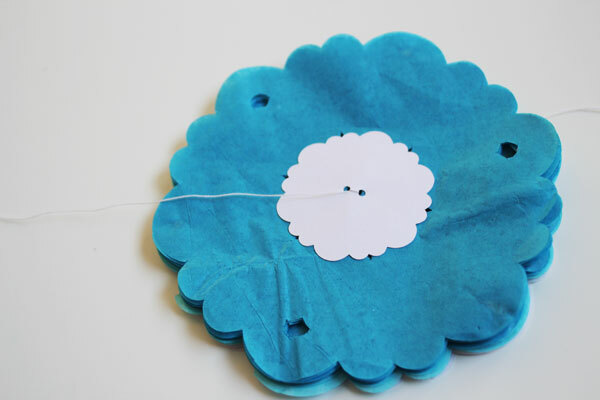 Thread the string through one of the holes in the cardstock end, through the center hole of the stack of tissue flowers, and out the cardstock hole on the other end. You can tie one end now. Wait until you stretch out the streamer before you tie the other end. That is it! 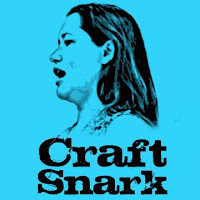 So fun and festive – you can make yours in whatever seasonal colors you like! If you liked these tissue paper streamers, you might also enjoy this Graduation party banner and this fun half birthday party idea! 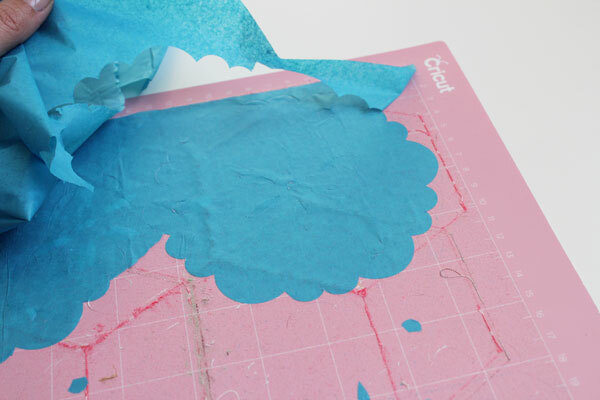 And check out all these other fun projects you can make with tissue paper and your Cricut Maker!